Urban Initiatives – How the World Cup is our non-profit’s best advocate. How the World Cup is our non-profit’s best advocate. This week I rode the elevator into work with a man dressed in a suit with a Mexico jersey under his sport coat. This week I’ve read half a dozen articles with titles like “Why the World Cup Matters”. This week, as I watched green face paint streaked tears roll down a man’s face, I have realized that because of the World Cup the rest of the world knows what our office says every day: there is an incredible and inherent power in sport. The World Cup is one of the clearest representations of the power of sport because of its international audience, its length and its worldwide appeal. Soccer is the most popular sport in the world, and the World Cup is its greatest stage. Our office, like many around the world have tuned into the games regardless of the time of day. We’ve paused during meetings for score updates and when a favorite team is playing you can often hear screams of horror and excitement through the walls of our office. The World Cup has pulled communities like our office together as millions of viewers tune in to cheer on their teams. We are not the only ones that espouse this view of sports. Nelson Mandela was a constant and dedicated advocate for the power of sport, claiming that, “Sport has the power to change the world. It has the power to unite people in a way that little else does. It speaks to youth in a language they understand. Sport can create hope where once there was only despair.” He made it his mission to bring the World Cup to South Africa, and he accomplished this goal in 2010. He understood soccer’s unifying power for people of all backgrounds and ages. Soccer means more than scoring goals- on our soccer fields in Chicago and in the World Cup. Soccer, and sport more generally, have the power to bring people together around a common goal. It bridges all manners of differences to unite people to cheer for their team. It builds character and it teaches people how to win and lose. It provides opportunities for the best of us to rise and be the Messi’s and Ronaldo’s of the next generation. It makes us root for the underdogs. For the 17,000 students that Urban Initiatives serves across Chicago, sport can mean some or all these things to them. At the very least, sport provides them an opportunity to get active and have fun in a safe, supervised environment. It can also mean that on game days they can meet new people and travel to a new neighborhood. They may even make a new friend on the field. Soccer can teach them that it doesn’t matter if they win or lose, but what matters is if they had fun or learned something new. It provides opportunities for young people to learn and practice leadership skills- the skills that will make them successful in the future but that are difficult to teach on a whiteboard. 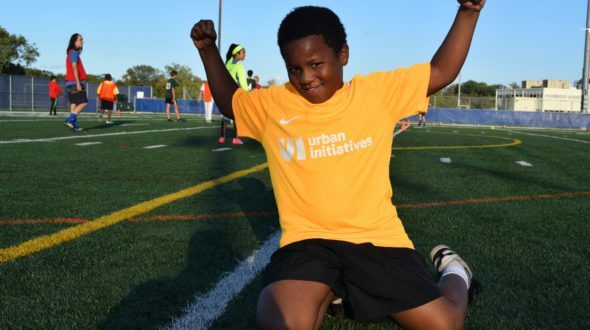 Most importantly, Urban Initiatives programming works to show our participants that so many people, from coaches to volunteers and parents, are rooting for their success. Urban Initiatives stakeholders, much like the crowd at World Cup matches, often have little in common with one another. Our stakeholders work in CPS, in massive law firms, and small local businesses. Without our students to bring them together, their paths may never cross. They may have played soccer for 20 years, or they may know nothing about soccer but have come to love the community that surrounds our programming. Our stakeholders are young, old and everything in between, but they come together to support our students. This is the power of sport at work. On July 14th, Urban Initiatives hosted it’s own Cup- the Corporate Challenge Cup. Although its stage was smaller than those in Moscow or Sochi, the Corporate Challenge Cup has the same values: let’s bring people together to compete against one another for a little bit of glory, but more importantly for the love of the game and all it offers our communities. 26 corporate teams, including Gallagher, Allstate, Morningstar, Northern Trust, and Grainger, came out to play in our much smaller soccer tournament, but the inherent, unifying power of sports was clear and the impact was great- the event raised over $100,000 in support of our programs. By giving sport the credit it is due, we can make it a priority for our youth who all deserve opportunities to play.